Modern grandparents are too busy to babysit. 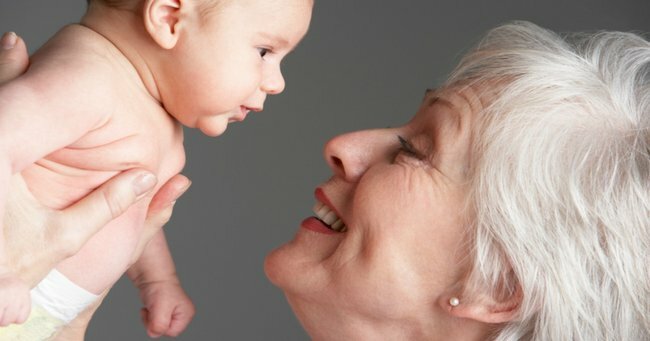 The rules modern grandparents want parents to follow. Linda* is hurridly eating a quick lunch of fetta, kale and pepita seeds out of a take away container when she stops to talk to me in the school playground as we wait for the bell. Its 3pm, but she has been on the go since her early morning walk at 5.30am. Since then she’s put in a full day’s work as a horticulturalist, stopped at the bookshop to pick up the latest novel for her bookclub and now she has dropped in to the playground to take her grandkids up the road for a milkshake before she heads home to get ready for date night. She’s 61 and prefers to see her grandkids on her terms, on her time – not when she’s scheduled for babysitting. She’s 61 and prefers to see her grandkids on her terms. Image via Stock. Linda is what many researchers say is one of a new breed of grandparents. She’s not putting her hand up for babysitting or volunteering one day of her week to look after tantruming two-year-olds. She doesn’t do school holiday minding, nor after school duties. No, she’s done her time and is too busy living her life to go back there. “Oh I adore them” she tells me. “But I’m not their mother, nor their babysitter. I’ve got a job and a life of my own. Today’s grandparents, as explained recently by The New York Times are a combination of younger baby boomers and older Generation X’ers. They are under 65 and the majority, not yet retired. They are busy in a new phase of their lives that doesn’t have room for them to drop everything and care for their grandkids. Linda’s daughter, a fellow school mum tells me she understands her mum is busy but sometimes she wonders what it would be like to have one of those hands-on grandmas happy to pick up the gaps where working parents need it. Sometimes, when she pays for after-school care and day care she wonders if she’s lucked out. In Australia, the average age of grandparents is between 58- 60. But as Australians live longer and work longer these grandparents are more active, busier and, many of them, less interested in their grandchildren than the stereotype of a grandparent we have come to expect. According to McCrindle Research today&apos;s grandparents are a working generation: one in four males aged 68 are employed full time, and one in 10 females aged 68 are employed full time. In Australia, the average age of grandparents is between 58- 60. Image via IStock. It doesn’t mean they love their grandkids less, just that they aren’t willing to go back to &apos;parenting&apos;. “She told me she was not interested in baby-sitting. She said she’d come to visit but that she didn’t like newborns.” Image via IStock. In a questionnaire by Grandparents.com 13,270 grandparents responded to a survey about their priorities. Asked what’s stressful about being a grandparent, about one in five cited conflict with the grandchildren’s parents or difficulty juggling work and other time demands to be with grandchildren. “There are some parents who probably don’t have a realistic expectation of how invested their parents should be in the grandchildren,” Psychiatrist, Dr. Gail Saltz, told The New York Times. It’s hard not to take the grandparents’ ‘why should I be bothered?’ attitude personally.” Via IStock. An American mother, Catherine Connors told The New York Times that before she had her first child her mother “put her on notice”. What&apos;s the best advice your mother ever gave you? Post continues after video. Ms Pakula says that parents of young kids take advantage of their own parents. Among her rules she has written about, that she applies to her daughter and daughter-in-law are: "When we go on family vacations, I am not there to look after the kids while mummy and daddy have pina coladas on the beach. Do your research and find a local sitter." As well as, "I will do pickups from school, or look after toddlers, but NOT every day. And not so that mummy can go to Pilates. And I need at least three days notice, so I can clear my diary. (Emergencies excluded.)" Her comments polarised readers, some saying she was “selfish” others appreciating her honesty and blunt up-front attitude. “I will not be used as a regular babysitter, or a nighttime babysitter, so mum and dad can go out." Via IStock. But in a time when childcare prices strain family budgets beyond breaking point and more and more women are welcomed – and valued – in the workplac,e many families crave the help of grandparents more than ever. The bell rings and Linda’s two granddaughters rush out of their classrooms delighted to spend an hour in the company of their fit, active Nan. This is the grandma they know - she’s lively and interesting, a role model, rather than a babysitter and for this family, while not a free child minding service, she offers them just as much love as any other grandma does. And who could really ask for more than that? *Linda is not the real name of this lovely grandma, who for her grandkids sake asked me not to name her.